Rosehearty is a friendly coastal town lying four miles west of Fraserburgh. It was founded in the 14th century by a group of shipwrecked Danes. Rosehearty like its neighbour Fraserburgh, has always been primarily a fishing community. Early lairds built a harbour and supplied the locals with fishing boats in return for a share of their catch. During the boom years of the 19th century herring industry, over 130 boats operated out of Rosehearty and the town could boast of 12 curers. During the season, hundreds of temporary workers from other parts of Scotland would come into the town filling every available shed and byre in their search for lodging. After 1880, Rosehearty's herring fishing industry rapidly declined as Fraserburgh's larger harbour and rail links attracted the larger boats and, consequently, the curers. 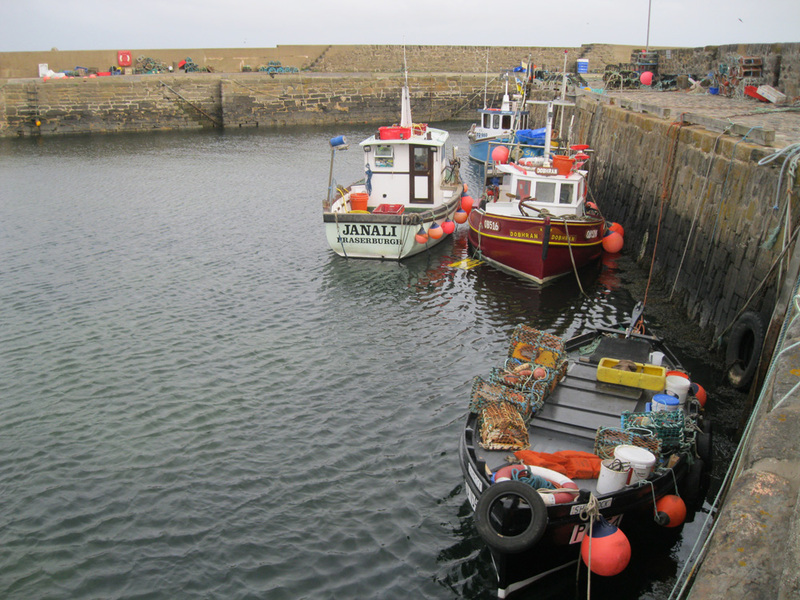 Rosehearty has two harbours, the old harbour formed of two stone piers and 2 acres in extent. Port Rae Harbour, now disused, lies to the east and has an area of 10 acres. During the herring season forty years ago it was scarcely large enough for all the drifters which landed their fish here for the twelve curers of Rosehearty. One of the oldest seaports in Scotland, Rosehearty at one time had a fishing fleet which supported 600 people. Extending to 3400 square metres, this is a one-basin harbour which offers 120 metres of quayside inside the harbour with a further 120 metres on the outer breakwater, but this is exposed to winds from between East and North-east. Around 20 boats, most involved in part-time fishing, use the harbour regularly. The harbour virtually dries out at low tide, restricting accessibility, but the breakwater, though exposed, can be used at all states of the tide. Vessels entering the harbour should keep the black and white leading poles in line until 30 metres from the point of the West Pier then, keeping the poles to post, enter midway between the West Pier and the line of the leading poles. The harbour should not be approached in onshore winds. The adjacent Port Rae should not be entered without local knowledge because of unmarked rocks. The slipway may be used for launching or recovery apart from 1 to 2 hours either side of low water depending on tidal flow. Slipway users should use the car park for trailers and car parking.